This pasta recipe is very quick and easy to prepare, and it’s also a very popular recipe for kids! Mac and Cheese is not a traditional Mexican recipe, but it has somehow been adopted in many Mexican homes and is a favorite at children’s parties and other types of celebrations. I think that maybe someone, many years ago, was trying to imitate the popular American dish and lacked yellow cheddar cheese, and decided to add the red bell pepper instead to give color to the pasta. At least, that’s my theory about why this recipe is prepared the way it is. As many of you may know, American meals have a significant influence on the border states of Mexico, in the same way, that you find Mexican dishes being adopted in the United States, like in Texas and Arizona, where you find that burritos or chimichangas are an everyday kind of thing for some. This pasta dish is one of the American dishes that has made its way into Mexican homes; I grew up in a state bordering the US, and this way of preparing pasta has been around since I was a kid. It also made with other types of pastas, like spaghetti or penne. I often shop at Wal-Mart, and I was very surprised to see La Moderna brand pasta boxes alongside the other premium pasta brands since they’re usually placed in the Latin food section. And let me tell you, I’m so glad that they finally have the place they deserve; this brand has been around for ages in my country, and it has a lot of prestige due to the quality of their products, besides being a high protein pasta. I hope you check out La Moderna the next time you’re in the mood for pasta (they come in a black and golden box). Place cheese, roasted bell pepper, evaporated milk and reserved onion and garlic into your blender pitcher. Process until you have a smooth sauce. Set aside. Melt butter in a skillet over medium-high heat, making sure not to burn it. Once it has melted, add the cheese and bell pepper sauce. Cook for about 3 minutes, stirring from time to time. Season with salt and pepper. Mix the pasta with the sauce and cook for another 2 more minutes, just enough time to mix well. Serve immediately. Add some crushed pepper, if desired. If you don’t plan to serve it right away, add a couple of tablespoons of milk when reheating, since the sauce tends to get dry when cold. This pasta recipe is very quick and easy to prepare, and it’s also a very popular recipe for kids! 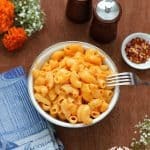 Mac and Cheese is not a traditional Mexican recipe, but it has somehow been adopted in many Mexican homes and is a favorite at children’s parties and other types of celebrations. Place water, salt, onion, garlic and bay leaf in a saucepan. Turn heat to medium-high. 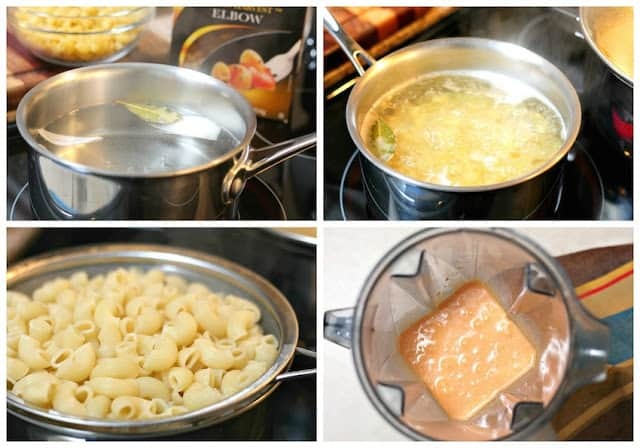 Once the water starts boiling, add the pasta. Cook for 10 minutes. Drain and reserve the onion and garlic. add a couple of tablespoons of milk when reheating, since the sauce tends to get dry when cold. 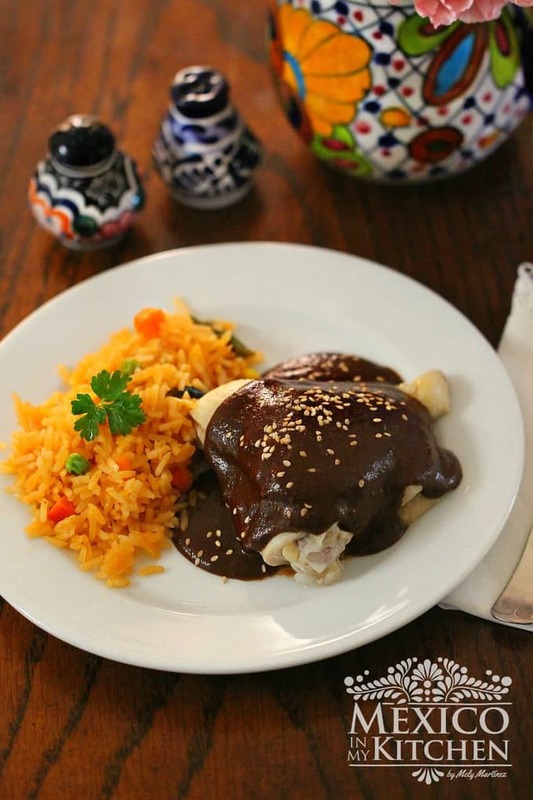 *In Mexico, the canned or jarred red peppers are the ones used for this recipe. **You can substitute the evaporated milk for regular milk, or better yet, you can use Mexican cream. To enjoy a completely different take on this pasta, add one chipotle pepper, it’s simply delicious! And one last note: in Mexico, American cheese is usually the one used instead of cheddar cheese. Mely, I always check the mexican section for pasta and spices before looking at the american section. The pasta is more inexpensive and in smaller packages. I love that the spices come in a bag and I can just place it in my bottles I already have at home. Saves on post consumer waste! Yes! I also do the same thing, the spices come in small plastic bags and the prices are very reasonable. Plus, the pastas have different types of fun shapes. I love them for soups. Thank you for commenting! Happy cooking! Love your site and check it each day. I have a Masa Harina question. I can buy it marked for tortillas or tamales . What is the difference and can I switch them? As each the package mentions, one is used to make tortillas and the other to make tamales. The one used for tamales has a coarse texture, it can also be used for atoles. I sometimes also use the one that indicates for tortillas to make tamales, it has a fine texture but the tamales don't come out as fluffy as if you were using the one for tamales. it also depends in what type of tamales I'm making. My Mother would add 1 can of Mexican tomato sauce to the boiling pasta water. Bring to a low simmer and let it dry out for awhile. Then add thick slices of cheddar cheese cover let it melt. Delish. She used large elbow pasta. That sounds like an interesting combination. Did she also add the roasted red peppers? Hello there. If I use the jarred red peppers do I use the whole jar? It will depend on how large is the jar. Use the equivalent to one roasted pepper. Hi. My mom and grandma would make what they called sopa de macaroni when I was younger. They always used canned tomato sauce and seasoned it chicken bouillon then added whatever cheese they had on hand, which was usually munster cheese. I make it for my girls now, only we use colby jack cheese and they love it! I am going to give your recipe a try. It looks delicious! Thank you for trying this recipe and for coming back to leave a comment. This is a favorite for many kids in Mexico. My mom also used tomato sauce, along with diced tomatoes & diced onions. It wasn’t one of my favorites (I don’t like cooked tomatoes), but will try your recipe, since everything gets blended. It’s worth a try. Thank you for sharing all those great tips from your mom.